To see how I ended up selecting only the color of this sweatshirt to edit, see the tip entitled "Use Quick Mask Mode for Quick Paint-by-Number Selections." Painting a mask enables me to use a tool I'm really comfortable with—the paintbrush—in a way that is very forgiving. So when masking the sweatshirt in the previous illustration, if I start to get parts of the couch or my daughter's hair in the selection, I can easily fix that without having to fumble with those dancing ants again. Channels contain color information about an image. For example, in RGB images, there are four channels—one that specifies where red is displayed in the image, one that specifies where green is displayed, one that specifies where blue is displayed, and one that shows a composite, or combined, color profile for the image. When you save a selection or mask in Photoshop, it's placed in what's called an alpha channel, which can be accessed through the Channels palette. 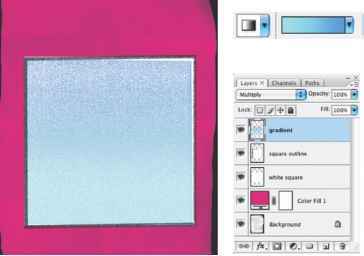 Unlike layer masks, which apply only to a certain layer or layers, masks saved in alpha channels typically apply to all layers in an image.